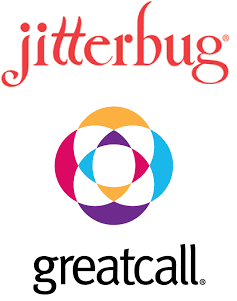 GreatCall is the Jitterbug phone service provider that offers affordable prepaid cell phone plans. GreatCall offers the Jitterbug cell phones, which are senior-friendly cell phones that provide the ease of use and for added peace of mind it comes with emergency call buttons. GreatCall specializes in the senior cell phone market and offers individual health and safety services for seniors, which makes it the best choice for seniors when it about the senior safety. GreatCall uses the Verizon’s network so, it gains the nationwide coverage from the biggest cell phone carrier in the United States, and offers only two cell phones for seniors, the Jitterbug Flip and the Jitterbug Smart, which is a smartphone for seniors. With GreatCall you’ll not be stuck with a long-term contract, it provides monthly prepaid plans and gives you the option to cancel anytime without any fees. With GreatCall you can customize your plan and choose what you need, the talk plans are separated from the text messages plans, the data plans, and the health packages. The Jitterbug talk plans start as little as $15 per month for 200 minutes with 60 days rollover for the unused minutes and no long distance charges inside the United States. For $50 you get unlimited talk, text, and 100 MB of data. You should have the plans that fit your usage to prevent overcharges, which will be discussed below. The text messages plans start as little as $3 per month for 300 messages. If you rarely need the text messages service, you can use the pay as you go option and pay 10 cents/each text message. Below is the list of the messaging packages you can add your plan. GreatCall offers six different data plans start as low as $2.5 per month for 40 MB and leak the unlimited data option, which you can find with the most cell phone service providers. Below is the list of the Jitterbug data plans. $0.35 per each additional minute. $0.1 per each additional text or photo messages. $0.1 cents per each additional megabyte. With international calls and roaming, overage charges may be applied. Some of the GreatCall health and safety services are available through smartphone Apps, and the other can run on both basic and smartphones. GraetCall offers three different health and safety packages with different prices. If you subscribe to any of these packages you get %50 discount on any of the GreatCall talk plans. 5Star Urgent Response: you can call for help anytime 24/7 using the 5star button. The Wellness Call: get one call every week with a wellness expert. MedCoach: refill assistance and medication reminder service. Check-In Call: receive a daily call to check your medical status. Daily Health Tips: receive daily health tips messages. Brain Games: games to improve your memory. GreatCall Link: a smartphone App that gives the caregivers health status updates and emergency alerts. Urgent Care: allows full-time access to certified nurses and doctors. All the services contained in the preferred package. Personal Operator: live assistance with your daily tasks like looking up a phone number or making calls. Handset Replacement: allows phone replacement if it is broken, stolen or lost. GreatCall customized their service to fit senior citizen lifestyles; the plans are expensive compared to other service providers like Cricket Wireless and leaks data options, and when it comes to phone selection, you have only two models. But for seniors these two easy-to-use phones not offered by all of the other providers except Consumer Cellular which has Doro competitive devices, and when it comes to the senior safety the GreatCall health and safety services has no competitor.